Model/Supplier: LSM780NLO, Carl Zeiss GmbH. 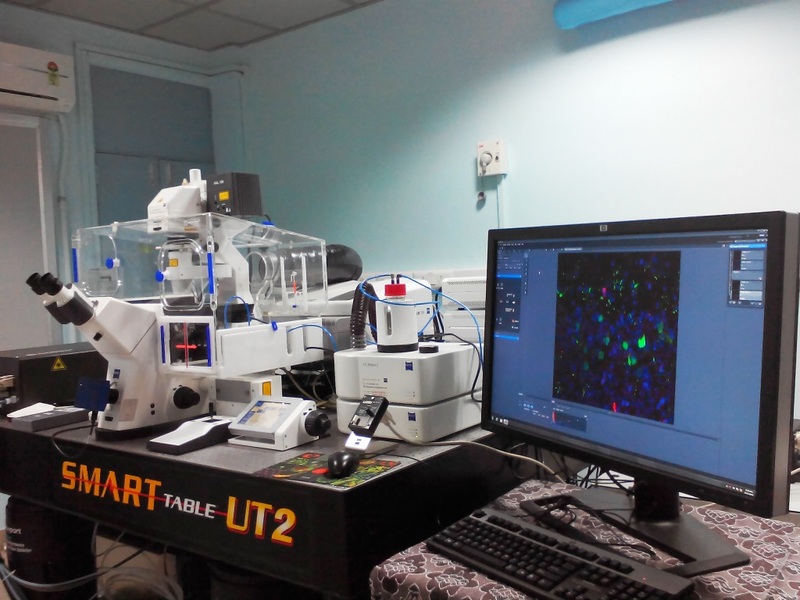 The facility includes: (i) a high-end inverted fluorescence microscope with onstage incubator for cell culture; (ii) programmable/motorized control features(X, Y and Z scans) for capturing bright field and flurescence imaging(for DAPI, rhodamine, TRITC, FITC, GFP, YFP, and CFP) using a high resolution peltier cooled monochrome camera. The system is supported with tunable fentosecond laser source (tuning range: 690-1040nm) with PMT and GaAsP modules for signal detection. The system is capable of simultaneousacquisition and separation of 10 fluorophores and includes control software modules for controlling all motorized components of microscope, laser scan head, laser module,stage incubation system and the digital camera. The facility in addition has incubator and bio-safety cabinet for handling of mammalian cell and tissue cultures. • Imaging dynamic microphometric changes in cells and organ cultures using fluorescence markers to understand properties such as cell growth, differentiation and migration. • Photo activation or photo-conversion experiments to mark a single cell, organelles in a cell or molecules in a cell to track dynamic changes over time in response to changes in environment. • Intracellular trafficking such as cargo delivery and their fate using fluorescence probes. • FRET analysis to quantify the proximity and interaction molecules in a living cell. • Imaging of dynamic changes in the cellular physiology such as changes in the levels calcium, pH, etc. • Checking efficiency of contrast reagents and organ cultures. 1) Click the link "Request Slots" and fill in the details as requested. Please mention the sample type,fluorophore used, emission and excitation wavelength for imaging. You can select an empty slot 1 month in advance and only for week days. You can check the availability of slots using the module "Check Slot" or you can check "Booking status" to see all the slots which have already been taken. 2) Once you submit the request, an invoice will be generated. Please submit this invoice to Neetu Dey (Internal No: 7830) within 24 hours.If you do not submit within this time, your slot will get automatically cancelled and will be open for booking again. drop a mail to neetud@iitk.ac.in if you are not able to submit the form in time,do it by 4:30 PM the day before booking. If it is necessary to do the cancellation, do it by 5 PM the day before booked slot else you will be charged for the booking. 3) Lab-in-charge will then accept your booking and you can check your status at "Booking status".